2 Legends on one stage! 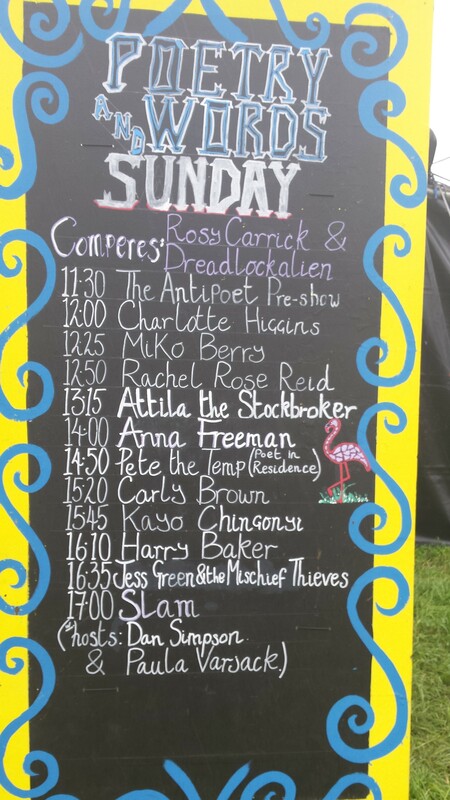 The afternoon got off to a great start with the adorable Antosh Wojcik, the wonderful Charlotte Higgins, and the amazing MC Gramski. The ex-clown Sara Hirsch’s Christopher Nolan’s Intersteller-inspired love poem was great. Wil Greenway treated us to another slice of his warped mind. And then MiKo Berry launched into an incredible set of pain and passion with the immortal line “Silver is the manliest glitter!”. He’s not the first passionate Scotsman, but he’s probably the only one on stage with purple trousers, a black vest and a pink headband. 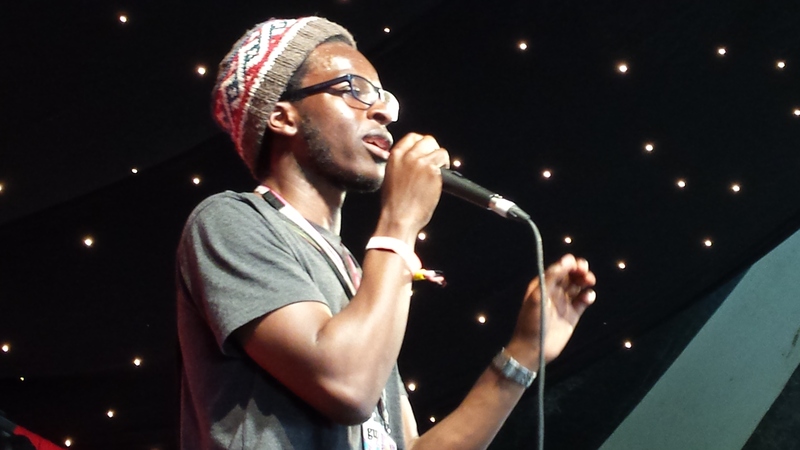 Next up was Kayo Chingonyi who delivered a beautifully chilling line that stays with me “..who wields a cutthroat like a paintbrush”. 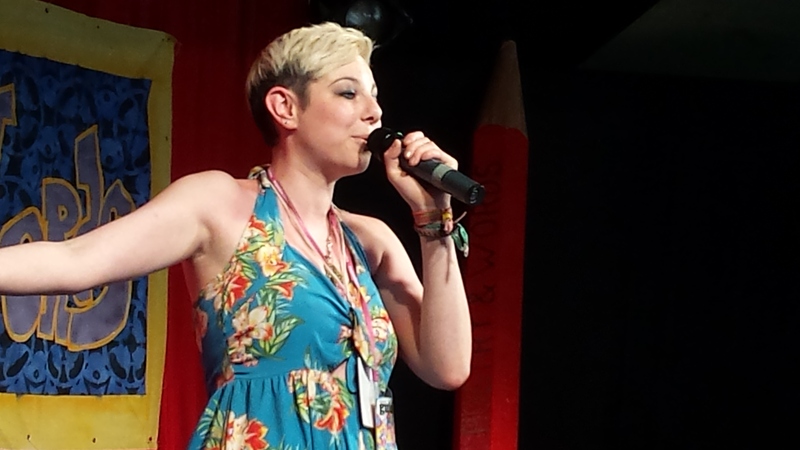 A wonderful engaging performer. 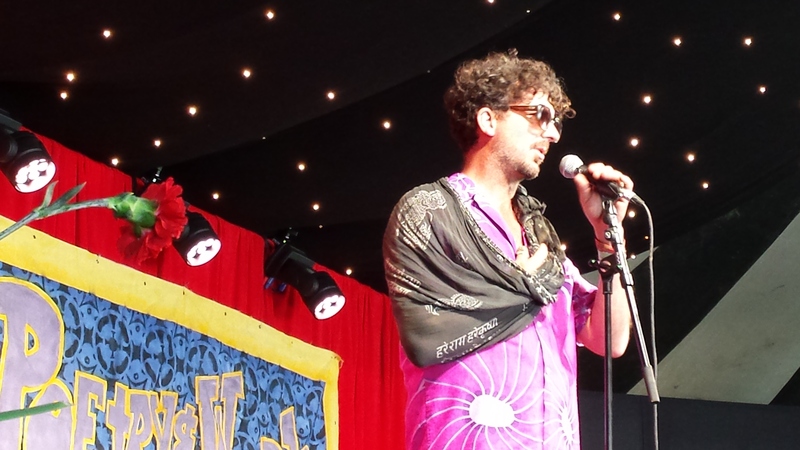 Murray Lachlan Young swaggered on stage with his arm in a sling (a cricketing injury I was told) and wooed the crowd with his very own je ne sais quoi. Then the penultimate poet. 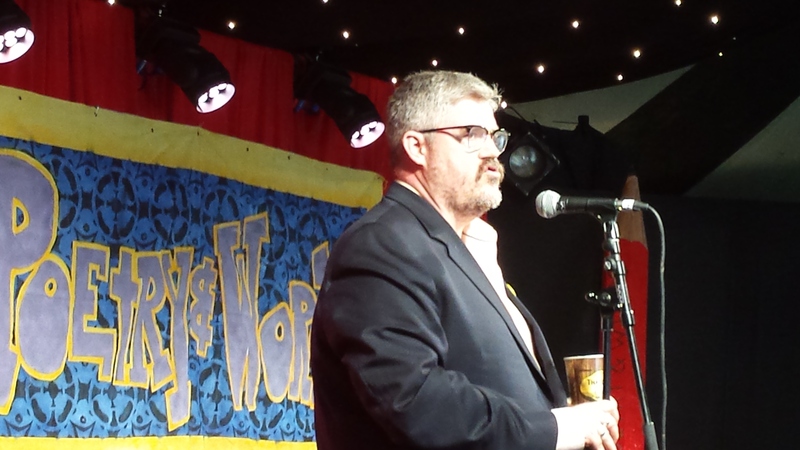 The legend that is Porky Poet (Phill Jupitus) arrived somewhat bewildered as he’d just been attacked by a hessian giraffe. His fame is well-deserved. An incredibly engaging presence on stage. His StarWars haikus were marvelous. I loved “That’s no moon…but it has much of the romance”. 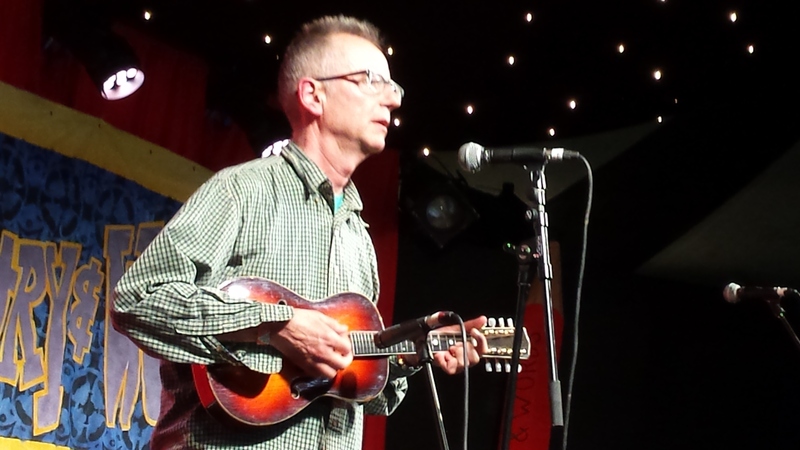 And then our headline act….the inimitable bundle of audience-participatory joy, Mr. John Hegley. John is the absolute master of the Poetry&Words tent. His stagecraft and lightness of touch is an absolute pleasure to watch. 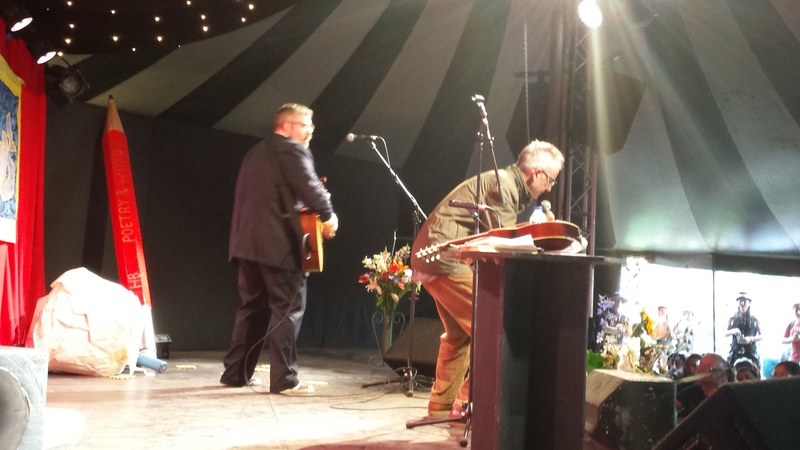 And if that wasn’t enough, he was joined on stage by Phill Jupitus for a final glorious musical number that had the crowd ecstatic! Just brilliant. 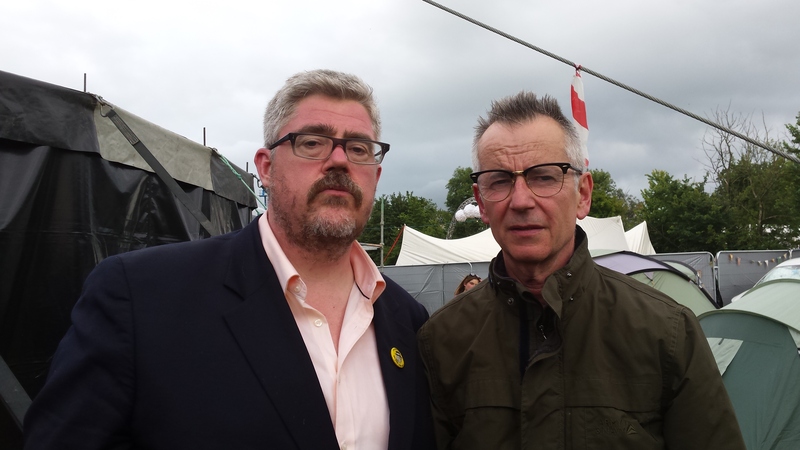 Like a punk Laurel and Hardy reuniting for a guerilla rock gig. Sometimes travelling slowly tires the mind. Life can be a heavy chain. climbing ever upwards, ever higher, dancing and jumping. making me feel tranquil, bringing me to tears. Contributor (in line order): Netty (title), Martin, Dave, Caroline & Vanessa, Anon, Louise & Arijana, Jess with Dave & Scott, Carly. on this joyful journey through life. the cranky elephant flew through the kitchen window. It’s slowing down the brain machine. where the mud wasn’t smooth enough. There’s a shiny diamond hidden under the hill, essential to the Alps. finishing the washing up in the bank. my skeleton, within a peloton of excellently joyful pedestrians. Contributors: Donna Daniels-Moss, Laura, Joshua Robinson, Peter, Peter (2), Julia + Matt, Mark Thomas, Lauren, Connect 4, Danny T-G, Stockie Jim, Lynn, Gramsky, Val + Ian + Declan, Joel Lynch. 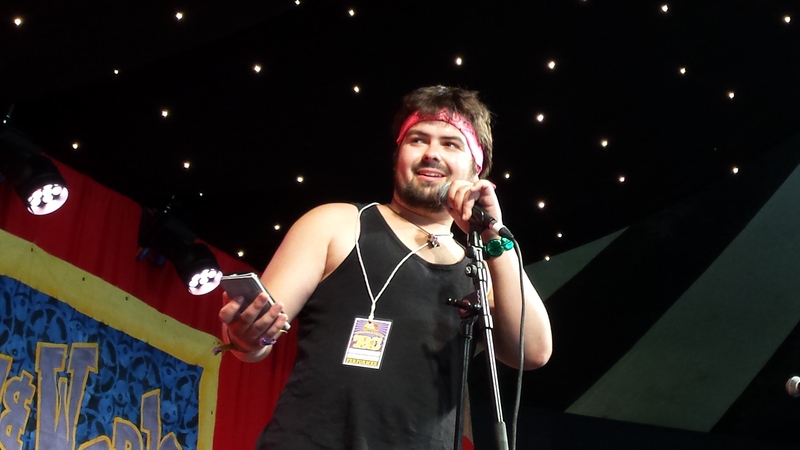 There’s still a couple of spots left for the Slam tonight, so hurry along when the tent opens to sign up!